They say that one player never makes up a team, but how about one player certainly changes the entire game outcome and strategy another team has to make to compete against them. Tonight the Mystics felt the absence of Elena Delle Donne in the final minutes of a 81-76 loss to the Dream in Game 3. Brittney Sykes scored 17 points, and Elizabeth Williams had 14 for the Dream. Atlanta is one victory away from the franchise’s fourth finals appearance and first since 2013. 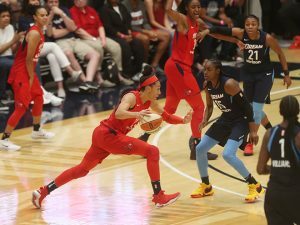 Playing without Delle Donne, who suffered a bone bruise on her left knee in the closing minutes of Tuesday’s 78-75 Game 2 loss at Atlanta, didn’t unnerve the Mystics. It did force several lineup changes including a four-guard look as Washington searched for winning combinations. Washington who has seemed to have trouble getting other key players going like Kristi Toliver, who had just two points until late the fourth quarter. Natasha Cloud also has missed the feeds from Delle Donne and sometimes has evidenced tonight by the turnovers created by Cloud when looking for offensive options. Game 3 is on Sunday afternoon in D.C, where it becomes do or die for the Mystics on their season. Don’t expect Delle Donne in this game either unless things change with her knew in the next two days.